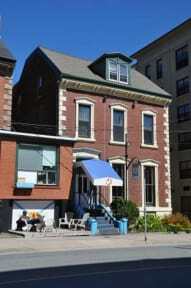 HI - HALIFAX Situated right in the heart of Halifax's downtown, Heritage House Hostel is 200m from the bus and train stations, so getting here is easy!! Halifax, founded in 1749, to establish British strength in North America has much history and culture, including a cool, summer Jazz Festival, a funky Busker's Festival, the International Tattoo, and the Titanic Graveyard. The hostel is close to the city's best music and pubs, and a pleasant 2 minute stroll from the Harbour Front/Boardwalk and some of the best seafood you'll enjoy in Canada!! And if it's cooking for yourself that you choose we have a large, well equipped, self catered kitchen. The weekend Farmer's Market, an asian food speciality shop as well as various large grocery stores are all within a short walk's distance. And remember that your HI Membership card will get you discounts at several nearby local restaurants. We do not allow sleeping bag in the hostel. All guests can enjoy our Free WiFi internet connection. Internet kiosks ($) are available to those travelers who travel light without a laptop. Coin operated laundry is availble each day from 5pm - 11pm for your convenience. 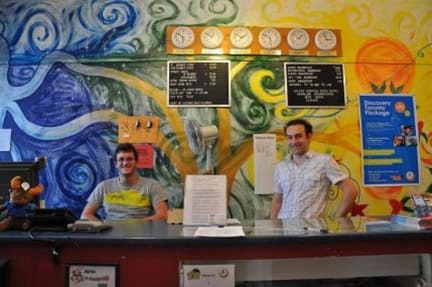 The hostel is a great base from which to explore the rest of Atlantic Canada! Closed between 24th of December 2pm - 26th of December 7:30am. HI Hostels are a Membership based Organization and there are Member and Non-Member prices. Private Rooms are available that sleep 3-5 people! Please contact us by email or telephone to book these! Hope to see you in our beautiful City by the Sea soon! I had a very nice stay in the hostel. just out of the city center, but close to the railway station. I came in late, but staff was really easy going so no problems.